Understand all the various types of "cash flow"
Finance professionals will frequently refer to EBITDA, Cash Flow (CF), Free Cash Flow (FCF), Free Cash Flow to Equity (FCFE), and Free Cash Flow to the Firm (FCFF – Unlevered Free Cash Flow), but what exactly do they mean? There are major differences between EBITDAEBITDAEBITDA or Earnings Before Interest, Tax, Depreciation, Amortization is a company's profits before any of these net deductions are made. EBITDA focuses on the operating decisions of a business because it looks at the business’ profitability from core operations before the impact of capital structure. Formula, examples vs Cash FlowCash FlowCash Flow (CF) is the increase or decrease in the amount of money a business, institution, or individual has. In finance, the term is used to describe the amount of cash (currency) that is generated or consumed in a given time period. There are many types of CF vs FCFFree Cash Flow (FCF)Free Cash Flow (FCF) measures a company’s ability to produce what investors care most about: cash that's available be distributed in a discretionary way vs FCFEFree Cash Flow to Equity (FCFE)Free cash flow to equity (FCFE) is the amount of cash a business generates that is available to be potentially distributed to shareholders. It is calculated as Cash from Operations less Capital Expenditures. This guide will provide a detailed explanation of why it’s important and how to calculate it and several vs FCFFUnlevered Free Cash FlowUnlevered Free Cash Flow is a theoretical cash flow figure for a business, assuming the company is completely debt free with no interest expense. It's used in financial modeling to calculate a company's enterprise value. The formula = EBIT - Taxes + Depreciation & Amortization - Capex – Change in Working Capital and this Guide was designed to teach you exactly what you need to know! CFI has published several articles on the most heavily referenced finance metric, ranging from what is EBTIDAEBITDAEBITDA or Earnings Before Interest, Tax, Depreciation, Amortization is a company's profits before any of these net deductions are made. EBITDA focuses on the operating decisions of a business because it looks at the business’ profitability from core operations before the impact of capital structure. Formula, examples to the reasons Why Warren Buffett doesn’t like EBITDAWarren Buffett - EBITDAWarren Buffett is well known for disliking EBITDA. Warren Buffett is credited for saying “Does management think the tooth fairy pays for CapEx?". 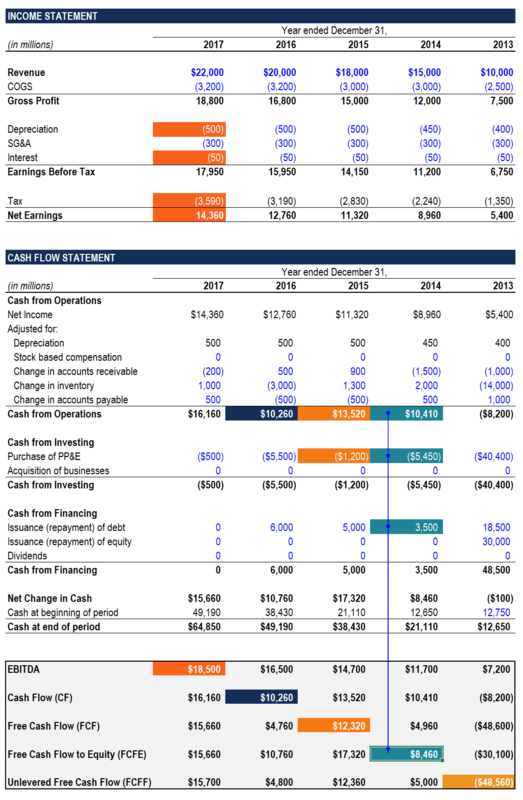 In this cash flow (CF) guide will provide concrete examples of how EBITDA can be massively different from true cash flow metrics. It is often claimed to be a proxy for cash flow, and that may be true for a mature business with little to no capital expenditures. EBITDA can be easily calculated off the income statementIncome StatementThe Income Statement (or Statement of Profit and Loss) shows performance from operations of a business. The financial statement begins with revenues and (unless depreciation and amortization are not shown as a line item, in which case it can be found on the cash flow statement). As our infographic shows, simply start at Net Income then add back Taxes, Interest, Depreciation & Amortization and you’ve arrived at EBITDA. As you will see when we build out the next few CF items, EBITDA is only a good proxy for CF in two of the four years, and in most years, it’s vastly different. Operating Cash FlowCash FlowCash Flow (CF) is the increase or decrease in the amount of money a business, institution, or individual has. In finance, the term is used to describe the amount of cash (currency) that is generated or consumed in a given time period. There are many types of CF (or sometimes called “cash from operations”) is a measure of cash generated (or consumed) by a business from its normal operating activities. Like EBITDA, depreciation and amortization are added back to cash from operations. However, all other non-cash items like stock-based compensation, unrealized gains/losses, or write-downs are also added back. 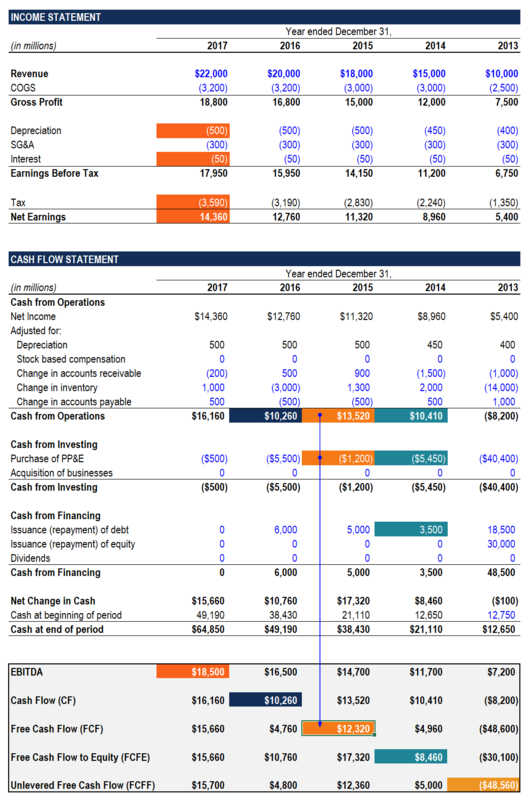 Unlike EBITDA, cash from operations includes changes in net working capitalNet Working CapitalNet Working Capital (NWC) is the difference between a company's current assets (net of cash) and current liabilities (net of debt) on its balance sheet. It is a measure of a company’s liquidity and its ability to meet short-term obligations as well as fund operations of the business. The ideal position is to items like accounts receivable, accounts payable and inventory. Operating cash flow does not include capital expenditures (the investment required to maintain capital assets). Free Cash FlowFree Cash Flow (FCF)Free Cash Flow (FCF) measures a company’s ability to produce what investors care most about: cash that's available be distributed in a discretionary way can be easily derived from the statement of cash flows by taking operating cash flow and deducting capital expenditures. FCF gets its name from the fact that it’s the amount of cash flow “free” (available) for discretionary spending by management/shareholders. For example, even though a company has operating cash flow of $50 million, it still has to invest $10million every year in maintaining its capital assets. For the reason, unless managers/investors want the business to shrink, there is only $40 million of FCF available. Free Cash Flow to EquityFree Cash Flow to Equity (FCFE)Free cash flow to equity (FCFE) is the amount of cash a business generates that is available to be potentially distributed to shareholders. It is calculated as Cash from Operations less Capital Expenditures. This guide will provide a detailed explanation of why it’s important and how to calculate it and several can also be referred to as “Levered Free Cash Flow”. This measure is derived from the statement of cash flows by taking operating cash flow, deducting capital expenditures and adding net debt issued (or subtracting net debt repayment). FCFE includes interest expense paid on debt and net debt issued or repaid, so it only represents the cash flow available to equity investors (interest to debt holders has already been paid). FCFE (Levered Free Cash Flow) is used in financial modelingWhat is Financial ModelingFinancial modeling is performed in Excel to forecast a company's financial performance. Overview of what is financial modeling, how & why to build a model. 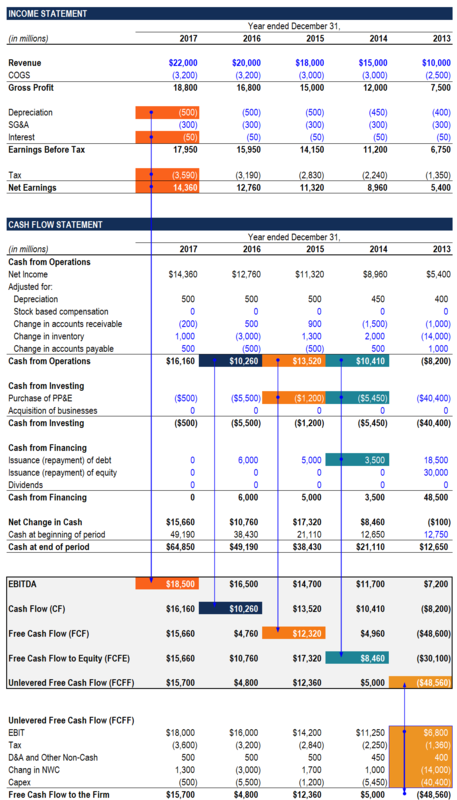 A 3 statement model links income statement, balance sheet, and cash flow statement. More advanced types of financial models are built for valuation, plannnig, and to determine the equity valueEnterprise Value vs Equity ValueEnterprise value vs equity value. This guide explains the difference between the enterprise value (firm value) and the equity value of a business. See an example of how to calculate each and download the calculator. Enterprise value = equity value + debt - cash. Learn the meaning and how each is used in valuation of a firm. 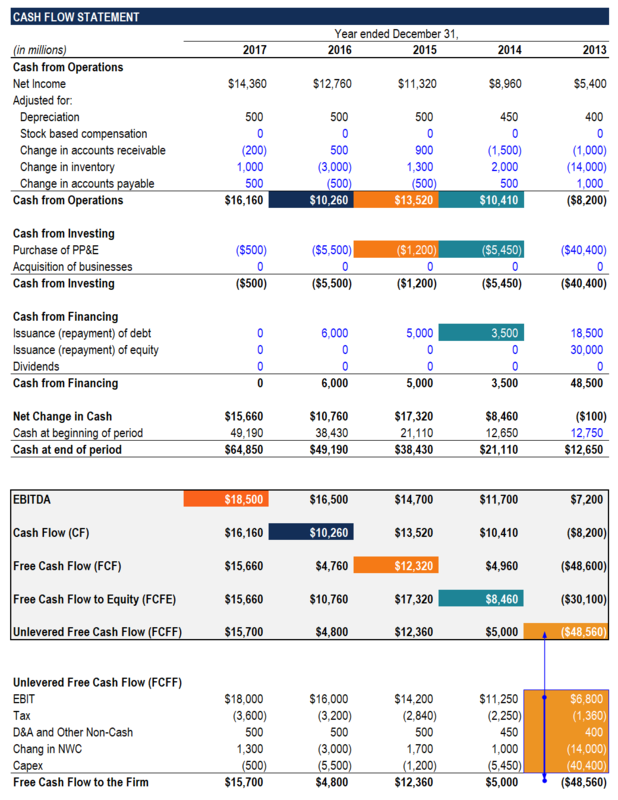 Free Cash Flow to the Firm or FCFF (also called Unlevered Free Cash FlowUnlevered Free Cash FlowUnlevered Free Cash Flow is a theoretical cash flow figure for a business, assuming the company is completely debt free with no interest expense. It's used in financial modeling to calculate a company's enterprise value. The formula = EBIT - Taxes + Depreciation & Amortization - Capex – Change in Working Capital) requires a multi-step calculation and is used in Discounted Cash FlowDiscounted Cash Flow DCF FormulaThe discounted cash flow DCF formula is the sum of the cash flow in each period divided by one plus the discount rate raised to the power of the period #. This article breaks down the DCF formula into simple terms with examples and a video of the calculation. The formula is used to determine the value of a business analysis to arrive at the Enterprise Value (or total firm value). FCFF is a hypothetical figure, estimate what it would be if the firm was to have no debt. This i the most common metric used for any type of financial modeling valuation. If someone says “Free Cash Flow” what do they mean? The answer is, it depends. They likely don’t mean EBITDA, but they could easily mean Cash from Operations, FCF, and FCFF. Why is it so unclear? The fact is, the term Unlevered Free Cash Flow (or Free Cash flor to the Firm) is a mouth full, so finance professionals often shorten it to just Cash Flow. There’s really no way to know for sure unless you ask them to specify exactly which types of CF they are referring to. Which of the 5 metrics is the best? The answer to this question is, it depends. EBITDAEBITDAEBITDA or Earnings Before Interest, Tax, Depreciation, Amortization is a company's profits before any of these net deductions are made. EBITDA focuses on the operating decisions of a business because it looks at the business’ profitability from core operations before the impact of capital structure. Formula, examples is good because it’s easy to calculate and heavily quoted so most people in finance know what you mean when you say EBITDA. The downside is EBITDA can often be very far from cash flow. Operating Cash Flow is great because it’s easy to grab from the cash flow statement and represents a true picture of cash flow during the period. The downside is that it contains “noise” from short-term movements in working capital that can distort it. FCFE is good because it is easy to calculate and includes a true picture of cash flow after accounting for capital investments to sustain the business. The downside is that it most financial models are built on an un-levered (Enterprise ValueEnterprise ValueEnterprise Value, or Firm Value, is the entire value of a firm equal to its equity value, plus net debt, plus any minority interest, used in valuation. It looks at the entire market value rather than just the equity value, so all ownership interests and asset claims from both debt and equity are included.) basis so it needs some further analysis. Compare Equity Value and Enterprise ValueEnterprise Value vs Equity ValueEnterprise value vs equity value. This guide explains the difference between the enterprise value (firm value) and the equity value of a business. See an example of how to calculate each and download the calculator. 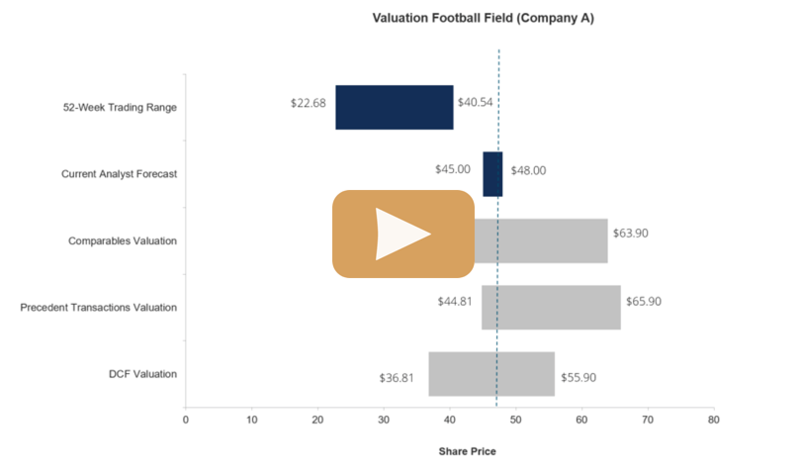 Enterprise value = equity value + debt - cash. Learn the meaning and how each is used in valuation. FCFF is good because it has the highest correlation of the firm’s economic value (on its own, without the effect of leverage). The downside is that it requires analysis and assumptions to be made about what the firm’s unlevered tax bill would be. This metric forms the basis for valuation most DCF models. CF is at the heart of valuation. Whether it’s comparable company analysis, precedent transactions, or DCF analysisDCF Model Training Free GuideA DCF model is a specific type of financial model used to value a business. 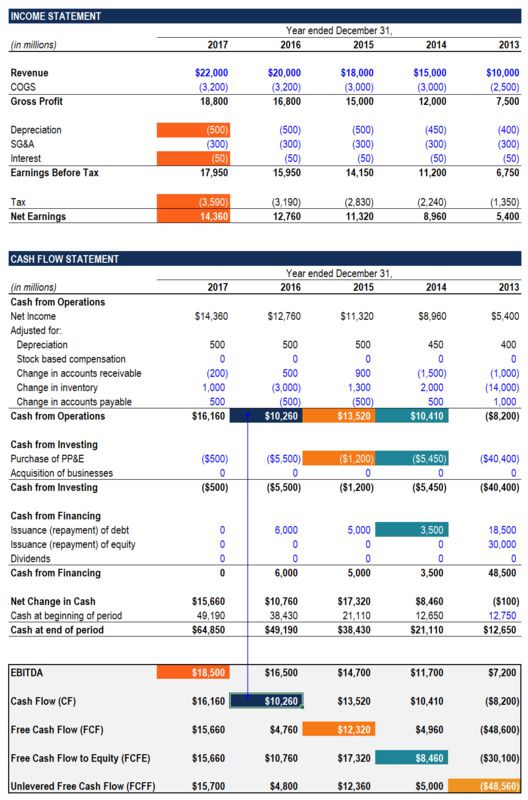 DCF stands for Discounted Cash Flow, so the model is simply a forecast of a company’s unlevered free cash flow discounted back to today’s value. This free DCF model training guide will teach you the basics, step by step with examples and images. Each of these valuation methods can use different cash flow metrics, so it’s important to have an intimate understanding of each. In order to continue developing your understanding, we recommend our financial analysis course, our business valuation course, and our variety of financial modeling courses in addition to this free guide. 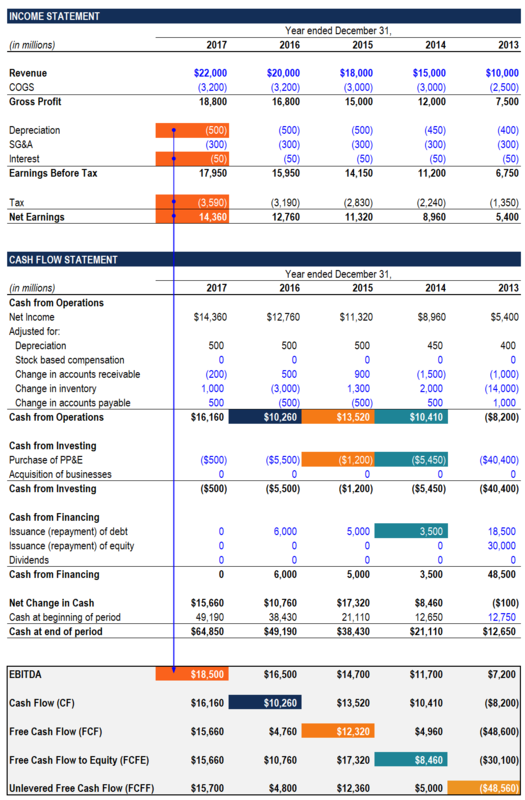 We hope this guide has been helpful in understanding the differences between EBITDA vs Cash from Operations vs FCF vs FCFF.